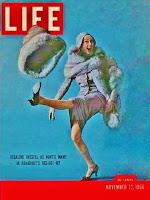 After reigning, indisputably, as Bway's Queen of Musical Comedy for nearly three decades, Ethel Merman, age 51, roared back into town, following "a Jeep among Cadillacs" (as she called her last ill-fated vehicle, Happy Hunting--which nevertheless ran a year on Bway) in what proved to be the "King Lear" of female musical roles: Rose--the monster "momma" of stripper Gypsy Rose Lee. As befitting Merman's astonishing and prolific career, Gypsy topped everything that came before--a hat trick few are ever lucky enuf to pull off for their swan song. But tho Walter Kerr famously acclaimed it "The Best Damn Musical I've Seen in Years" it wasn't quite the smash hit it wanted to be. Ethel stayed thru the entire 22 month run on Bway, but only the first seven were SRO. Merman even took the show on the road, something she hadn't done--hadn't had to--in decades. Detroit, Cleveland, Boston, Toronto, Chicago, San Francisco, winding up, strategically, in LA in October of '61; giving Jack Warner and his minions a holler to catch her act. After losing nearly every stage role of hers in Hlwd, Merman had (finally) snagged the movie of her last filmable hit, Call Me Madam--which was all the better for it. And as the entire world seemed to concur that Gypsy was her supreme triumph, the assumption was widespread that she'd get to preserve her performance on celluloid. So, naturally, Jack Warner gave the part to Rosalind Russell. A movie star from the '30s who steadily rose to prominence thru the '40s, Russell was, by the early '50s, struggling for good roles more than Davis, Crawford or Stanwyck. The stage was potentially good refuge for middle-aged cinema stars; but for some, like Davis, (in the '52 revue, Two's Company and a decade later in Night of the Iguana), it was more akin to slumming. Roz, on the other hand, took Bway by storm, as if she'd been a stage trouper all along. Her two carefully chosen vehicles, Wonderful Town and Auntie Mame rebooted Russell's career so spectacularly she returned to Hlwd a new commodity; now awarded a series of roles from stage plays, whether she was suited for them (Picnic, Auntie Mame, Five Finger Exercise) or not (a Jewish widow in A Majority of One; a looney matron in the surrealistic Oh Dad, Poor Dad...) brokered by her producer hubby, Freddie Brisson, who was allegedly coined by Merman as the "Lizard of Roz." Whether she was suited for Gypsy's Rose Hovick, depends on your point of view. "Why does everyone intelligent hate the movie?" asks Ethan Mordden in his lively chronicle of Bway musicals. He finds the casting "extremely correct, especially given Russell's clobbering power as the meanest of Roses, the truest, the mother of all mothers." His charity is surprising when in the next breath he extoll's Meman's performance as "possibly even the greatest" in Bway musical history. I'll concede that Roz does fine in the scenes--she's tough, funny, charming; but she falls so short in summoing the dynamism these songs require, that it cheats the film of its central excitement. The musical was still too new, too fresh, too Merman-stamped to be tinkered with; to be garnished with fresh interpretations. It took a good fifteen years to grow into its stature as one of the greatest of all Bway tuners. In time, Merman's imprint faded as all comers took on the role--or at least all who dared. She couldn't own it forever; it's too good a role in too good a show. But in 1962 it should've been Merman. Who else might they might have considered? Perhaps the only justifiable musical talent to replace Merman, would've been Judy Garland. Wasn't she on the upswing then, coming off the triumph at Carnegie Hall and a second Oscar nom for simply acting in Judgment at Nuremberg? What a bundle of dynamite she would've been; what colors she would have found in the role! She even sang a number of the show's tunes in her concerts and on TV. But casting for drama rather than song opens the door to many possibilities. Watch any book scene and imagine Shelley Winters. Or even Crawford or Davis. What an intersting stretch it would have made for Lucille Ball. In this light, Roz Russell seems a valid choice. But that's irrelevant if the public won't buy it. Bway couldn't get enuf of her in Wonderful Town; a middle-aged woman impersonating a post-collegiate career gal. But they didn't accept a younger Carol Channing, who replaced her--and quickly closed the show. Examples like this made stars much less willing to step into other stars' roles in those days. As the thief of Merman's signature part, this same beloved Russell suffered the fallout of comparison and rejection. Funny how they are, the public. But there's nothing wrong with the casting of Karl Malden or, dare I say it, Natalie Wood. He is self-evident, but she is surprisingly good, but gets a bad rap here as she often does. Louise; who is, after all, rather dull and hopelessly untalented, isn't exactly an acting challenge on the order of Blanche DuBois. Natalie is quite understated thru-out, and when she finally comes into her own, her anger is palpable and effective. Even the mirror epiphany: "Momma, I'm pretty...I'm a pretty girl, Momma!" isn't the trembling camp clip we've overplayed in our minds, but in Natalie's reading startlingly restrained. Unlike the Puerto Rican virgin she last struggled to embody (and was still playing at the Rivoli) Wood was a fitting match for Gypsy Rose Lee--and the only actress ever to play the role to equal star billing as Rose. She even does her own singing here; which is perfect for Louise's marginal talent. 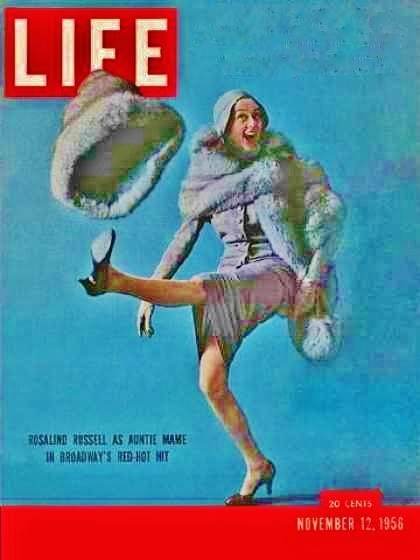 Roz Russell sang on Bway in songs tailored to her low range and comedic skill. 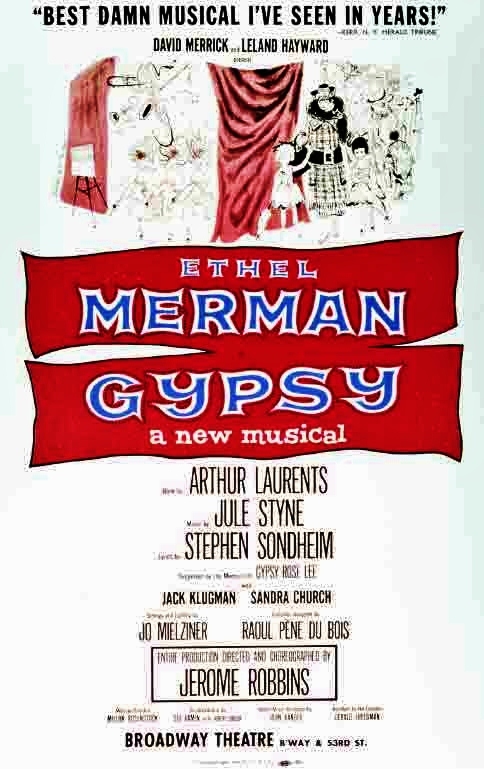 Gypsy was tailor-made for the Voice of Merman, which put a good deal of the score out of Russell's ballpark. Yet Russell's growl of a voice is so disntinctive, to find a singing match was a challenge. They settled on the "husky alto" tones of Bway actress, Lisa Kirk, whose claim to fame was singing "The Gentlemen is a Dope" in R&H's Allegro, and creating the role of Lois Lane in Cole Porter's Kiss Me Kate a year later. Her voice, while a deep enuf contralto has warm tones that don't work with Russell. Furthermore, the disjointed soundtrack is jarring in that Roz sings some songs in her own voice, others in Kirk's, and in the case of "Rose's Turn" goes back and forth within one number. No Ethel, no Judy = no bestselling soundtrack album. Here's one movie maybe Otto Preminger should've made. For one thing, he was Gyp's lover for awhile--she even secretly had his child, unbekownest to anyone (including the child, Erik) until decades later. The seedy backstage milieu was something Otto could sink his fangs into--as well as offer a semi-biographical tribute to his ex. Jack Warner gave it to senior veteran Mervyn LeRoy, who had made hard-edge dramas in the '30s like I Am a Fugitive from a Chain Gang and Little Caesar; weepies like Random Harvest and Madame Curie in the '40s; Quo Vadis and The Bad Seed in the '50s. But he was no stranger to musicals either having helmed Gold Diggers of 1933, Lovely to Look At and Million Dollar Mermaid, featuring Esther Williams. In other words, he was a field marshall, not a stylist. As producer and director, LeRoy had just wrapped A Majority of One, from a play by Leonard Spiegelgass--which happened to star Rosalind Russell (as a mother so Jewish she was played on Bway by Gertrude Berg--better known as "Molly Goldberg.") Roz didn't overact, but she didn't exactly convince either; yet she got a Golden Globe award (for comedy), and a very sure leg up on landing Gypsy. LeRoy also brought along Spiegelgass as screenwriter. A curious choice for choreographer is Robert Tucker, who was primarily a vocal coach at MGM. It would appear his duties here were more archival than creative; reproducing Jerome Robbins' vaudeville and burlesque routines. The film is surprisingly faithful to the show (including the score--a first for the always edited Jule Styne); and blessed with an exceptionally handsome production that's beautifully filmed in Technicolor. I don't believe I've ever seen the true theatrical widescreen version until now. It's illuminating in how good the actual film looks--shot by another master cinemtographer, Harry Stradling (who would later also shoot Funny Girl--Jule Styne's other stage-bio-musical hit). 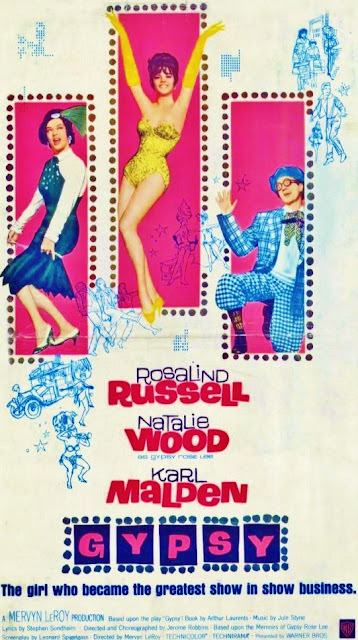 Warner Bros. had developed a penchant for filming their Bway hits with maximum fidelity: The Music Man, Damn Yankees, Pajama Game--and soon My Fair Lady were treated with a reverence bordering on the slavish. 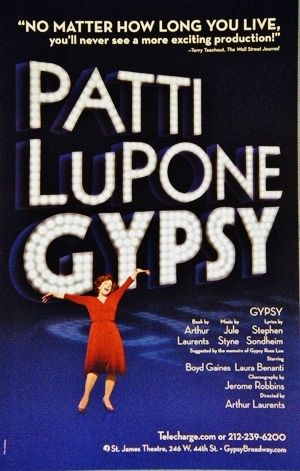 It was the same for Gypsy, too, which helped boost its postive reception upon release but, curiously, the movie quickly tarnished in reputation. Over the decades the stage show became a fixture of repertory, including several high-profile Bway revivals, deepening the myth that the movie was a gross misrepresentation. Arthur Laurents' libretto is broadly regarded as one of the greatest books of all musicals--and he certainly wanted to make sure we all knew it; taking over as director of subsequent revivals right up to his death. His contempt for the movie (much as it was for West Side Story) lead to an eventual remake in 1993--tho this time, in this uncertain market for musicals: made for TV--and not even cable, but CBS. Young guns, Craig Zadan & Neil Meron (who produced the first ever Sondheim Tribute way back in '74) had secured a development deal in Hlwd making movies for television. Zadan called the original movie a "disaster" in his "Sondheim & Co." tome, and after two highly lauded Bway revivals the show was making a case for a film remake. The Boys sold them on the strength of Bette Midler as Rose. For the remake they made certain not to stray from Laurents' stage text, but a comparison invites respect for the additions Spiegelgass made in his screenplay. I could do without Rose's expositionary narration; and it makes little sense to start the story with Rose & Girls returning home, when she should be clawing her way to leave Seattle, but Spiegelgass adds some needed warmth to Rose's character: "I'm a mother first, and don't you forget it! That's why I'm going to Seattle. So that June can see a dentist and Louise get her tonsils out." Herbie's already smitten--having met her before, as Uncle Jocko (the film combines Jocko with Herbie); "I knew you were a good mother." To which, Rose replies, much less motherly, "Anyone likes mothers so much shoulda been a father." Pure Mae West. None of the screenplay's expanded scenes are egregious or poorly scripted, but suggest a thoughful process of enhancing the material, much as had been done with The Music Man. Spiegelgass even dares to tweek Laurents' dialogue: Tessie Tura's displeasure at sharing her dressing room with "a troupe of professional virgins," plays funnier as "a troupe from the Virgin Islands." The screenplay layers in a pattern of dismissal of Louise's femininity--and in fact we never see her in a dress until the climactic strip. For most of the film she looks much like the ragamuffin Wood later overplayed in Inside Daisy Clover. While Tulsa imagines his own Ginger Rogers (in "All I Need is the Girl") Louise is dancing along in burlap pants, wearing cow's hoofs. Even after stepping into June's star spot, Rose dresses her in toreador pants. Of course it's all in service of Louise's eleventh hour transformation, and it works. What doesn't work is Robbins' brilliant stage wipe; the strobe-lighted passage of time that turns the tots into teens before our eyes, on screen is wasted on a cheap dissolve. And too bad the gag with Jack Benny--admittedly ageless, as a early vaudeville wannabee--falls flat with the most obvious of all punchlines, "He'll never get anyplace." But the movie adds depth and humanity to Rose & Herbie's romance, and gives Louise greater presence. Of all the Real Housewives of Canoga Park the one whose record collection I most envied was my best friend's mother, Esther. She had the nicest living room as well, with an enormous Magnavox stereo console --the size of a large desk--on which she constantly played the latest Bway cast albums, rocking the walls of the house with the thumping bass speakers. It was here that I first heard Gypsy blasting thru the living room while Esther vacuumed or baked muffins in the kitchen. I had a hard time stealing a moment or two away from Eric just to look at the record jackets of his mother's collection--which far exceeded mine--something I'd much rather do than go outside and shoot hoops in the driveway--which is what usually happened. I had the album myself by age 11 or 12, and as the songs are so narratively driven, I surely knew what it was all about. But where my parents had no pause taking me to something like Never on Sunday or The Apartment as a child, Gypsy, had a salaciousness to it that they deemed too risque for a child like moi; thus killing my hopes of seeing Gisele Mackenzie as Rose in the debut season at our new Valley Music Fair, the local concrete theater-in-the-round, where I began sampling live musical theater in the summer of '64. Thus I only knew Gypsy from the stellar stereo album, until its network TV debut on September 26, 1968--and then in pan & scan, and B&W. But Gypsy is a show of the stage, and thus on the stage has a charged electricity with the audience that seems more necessary to the narrative than say that of The King & I or The Music Man. 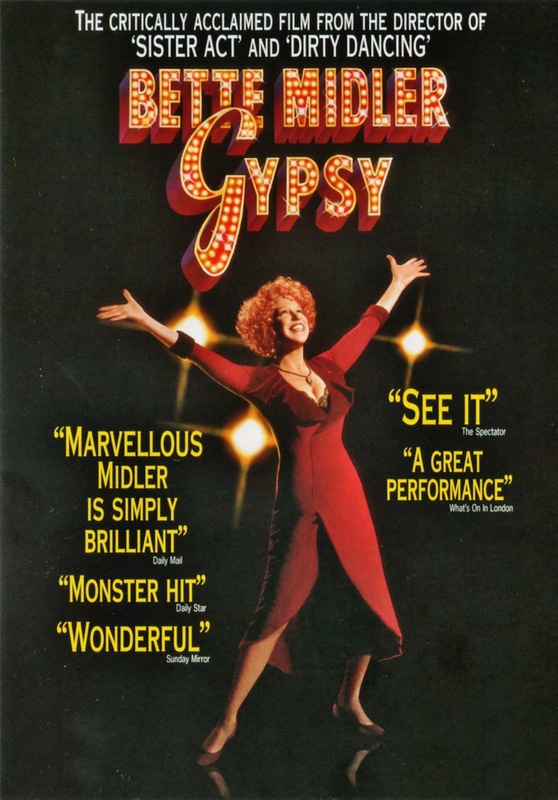 Unlike nearly all show-business themed musicals, Gypsy doesn't chart the usual hard road to success, but a steady downward spiral to the bottom; featuring a blatantly untalented central player, ruthlessly driven by a manic and delusional mother. 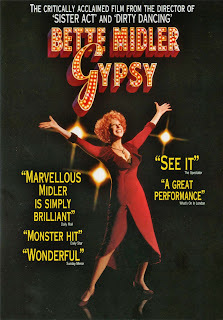 Subverting the cliche moment that nevertheless always works: the last minute change of performer/song/scene, that leads to the big breakthru, Gypsy plays it freighted with new angles: disgust, horror, surrender, desperation, self-destruction. Yet still, from this swill comes reversal of fortune. It's an easy show to love, but a difficult story to like. For Laurents, Sondheim and Robbins it was the follow-up to West Side Story, and a considerable change of pace, but no less revolutionary. Robbins wasn't anywhere near as keen on the show to begin with, and saw it as a panorama of vaudeville, burlesque and kiddie shows, hiring dozens of novelty and animal acts that were quickly let go. Perhaps Louise's "Little Lamb" was a remnant of the menagerie. (Whatever happens to the lamb anyway after she sings her song?--It's never to be seen again.) Is it sacrilege to say that I never really liked the song? Robbins wanted to cut it, and Styne threatened to walk if he did.. I'll side with Robbins on this one, tho I get the dramatic and emotional need it fills in the play. Much has been written about the making of the show. Laurents wrote half a book on the subject, and more recently Sondheim in his "Finishing the Hat" volume, shared some especially illuminating tales written in exquisite prose--with notes on the origin or creation of individual songs--including all those cut. The one song cut from the movie, "Together (Wherever We Go)" was ironically one of the more prominent tunes in pop play at the time--a real staple on TV variety shows for ages. The filmed footage survives in outtakes on DVD extras--and reveals no great loss. It adds nothing to the plot and shifts too quickly from a tense quarrel; and as the film has no intermission it loses its value as a second act opener designed to give breathing room before the runaway tension thru the climax. Like The Music Man, this is one of the few musicals with a second act even better than the first. With "Together" out, the last hour has but three numbers; the comic showstopper, "You Gotta Get a Gimmick"; Louise's first strip to "Let Me Entertain You," which morphs into the fastest rising-career montage in musicals--rendering it nearly irrelevant; and Momma's final blowout. On record "Rose's Turn" is a three act-play that is nothing less than revolutionary in musical theater; a nervous breakdown in song. The difference between Merman and Russell is that in Merman you get--in spades--that Rose really coulda been a contender. In Russell you get a Rose who's merely delusional. Take your pick which is the more effective ending. 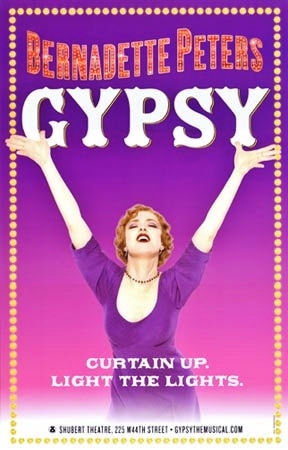 My second fall season living in New York began with the heralded London revival of Gypsy, starring Angela Lansbury. Those were still the days when one had to run down to the box office and wait in long lines to purchase tickets the day they went on sale. I was lucky enuf to get orchestra seats for Opening Night, and it shall always remain one of most memorable theater-going experiences of my life. Subsequently I have seen the Tyne Daly and Patti Lupone productions as well, and while I thought little of the former; and was quite taken with the latter, nothing could ever match the excitement of that evening at the Winter Garden with Angela. Lupone's production (which was Arthur Laurents' corrective to the fairly recent Sam Mendes-directed, Bernadette Peters version--which many hated) was justly lauded for having, in addition to a Rose of legendary stature, a Herbie (in Boyd Gaines) and a Louise (in Laura Benanti) that were definitive as well. This production also corrected something that had bugged me about most productions of the show, as well as the film: once June & Louise become their older counterparts, June seems to remain a child, while Louise towers over her and looks a decade older (Case in point: the pic's older June is played by 12 year old Ann Jillian, next to Wood's 24 year old Louise.) In Laurents' 2008 edition we get, at last, an "adult" June--one at least as tall as Louise (looking all the more appropriately ridiculous for it), and one who's more savvy and sarcastic than we've seen before. Great musicals reveal new layers with time. Altho musical stars like Judy and Barbra culled huge gay worship--they rose to fame equally embraced by the public at large. Bette Midler built her following entirely on a homosexual groundswell. Her move into the mainstream was somewhat bumpy, until Disney found a way of milking her oversize personality in a string of Hlwd comedies. Her penchant for loudmouthed broads like Betty Hutton and Martha Raye was evident in her USO epic, For the Boys--which earned her only Oscar nom since she channeled Janis Joplin. On paper she sounds ideal for a Rose circa 1993. Alas, she enters already chewing scenery and makes a steady diet of it for most of the movie. It's "Bette Midler doing Gypsy's Rose," --channeling not Merman so much as drag-master Charles Busch. I started imagining some more egregious diva attempts by Cher, Liza, Madonna--sketch parodies for Forbidden Bway. Speaking of which: Babs now wants to take her final, Rose-like bow, God help us. Rumor has it another remake is on the way, with the 70+ Streisand "Momma" Rose pushing her six year old girls. The Babs, of course, is "ageless," and we're all supposed to be grateful she's bestowing us another film musical (Sunset Blvd would be more appropriate); but one thing's clear already: there will never be a definitive film of this show. By its very construction Gypsy only works entirely when played on stage, feeding off the energy of a live audience. The CBS production was directed by Emile Ardolino, a specialist in dance films, starting in documen-taries, breaking into Hlwd with Dirty Dancing and Sister Act. Gypsy was his final film; he died of AIDS at the age of 50, one month before the network broadcast. As a remedy to the Warners film, the movie falls short. Shot in the boxy screen-ratio for TV, with a lesser production budget, it pales on a purely visual level--highlighting further the exceptional art direction of its predecessor. Alas, Bette's vocals, which are presumably the primary "corrective" are strangely off. Most of the songs don't sound right in her register, tho she does best--not surprisingly--on "Rose's Turn." Peter Reigert (Bette's one-time boyfriend) milks every ounce of dullness that's inherent in Herbie. Cynthia Gibb (a TV actress who previously played Karen Carpeneter in a TV movie) makes a bland and unmemorable Louise. But Young Louise is a surprising baby Elisabeth Moss (Mad Men's Peggy Olson). The film is also stuffed with cameos with the likes of Ed Asner, Tony Shaloub, Andrea Martin, Michael Jeter and Linda Hart that add little resonance to throwaway roles. One exception is Christine Ebersole's Tessie Tura, the best I've ever seen (tho she replaced Barbara Harris, who was first set to do it--a joy I can only imagine). Ebersole brings some real character to Tura. She has a unique and fascinating way of moving; you sense a real aging stripper resides within--early signs of the laser focus she would later bring to her dual signature roles in Grey Gardens. The previous Tessie, Betty Bruce, is far less dimensional. Warners' film has one of the trio from Bway, Faith Dane, repeating her role as Mazeppa--which, unfortunately, she plays to the second balcony. But doesn't Electra always seem to be lost? Has there ever been the perfect trio? Both films acknowledge the Overture as an indispensable element; tho it's much abridged in the Warners version, (that's Jule Styne conducting the orchestra in front of the red curtain displaying the titles). CBS gives us the entire glorious composition over a cheap and clumsy montage combining archival footage of vaudeville acts and blurry images of modern flashing neon. It sets off alarm bells from the get go. Warners released the film on November 1, '62 at Radio City. Since the b.o. bonanza of Doris Day & Cary Grant kept the Hall locked up all summer, the movies waiting in the wings were given short leash; five weeks before The Music Man reluctantly gave way to the sad-sack Jackie Gleason comedy, Gigot, which in turn gave way to a five week run of Gypsy before the Xmas attraction with Jumbo jumped in. 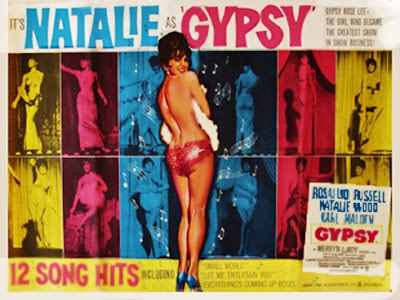 Gypsy, while not a blockbuster, did well enuf to come in as #11 for 1963, earning $5,700,000 in rentals. Now that musicals were Best Picture fodder, expectations were hopeful for Oscar recognition; but fell short in measure with Music Man. Rose is the Hamlet of female musical roles, but still Roz didn't make the cut, in what was arguably a heavily competitive category. (Anne Bancroft won over Katharine Hepburn, Geraldine Page, Lee Remick and Bette Davis.) She did however nab another Golden Globe in the lesser "comedy/musical" field. Only 3 Oscar noms were betowed: those for Harry Stadling's photography, Orry-Kelly's costumes and Frank Perkins' musical direction. All went home empty-handed. In the end, no matter how flattering its respect for the source, Gypsy, is most hurt in missing a key ingredient. Merman was as essential to the musical's creation as Laurents, Styne, Sondheim, and Robbins; and whether justly or not, her absence casts a long dark shadow over what might otherwise have been one of the best Bway transfers ever made by Hlwd. Standout Numbers: “All I Need in the Girl"
"Dainty June & Her Farmboys"
in front of a curtain--with flashing titles.